CabMaker32 embraces the 32 cabinet making system. Cabinets are stackable. Heights are in 32 mm increments. Widths may be virtually any size. Depths may be any size. Left and right panels are balanced. All hardware, hinges, slides, shelf supports use the 32 mm shelf holes. You can work in inches or millimeters. Choose a cabinet type and cabinet style. Configure doors, drawers, shelves etc. Or pick cabinets from named libraries and just enter in width and quantity. Total parts list, combined parts list and summaries automatically recalculate. Parts optimization is one button click away. 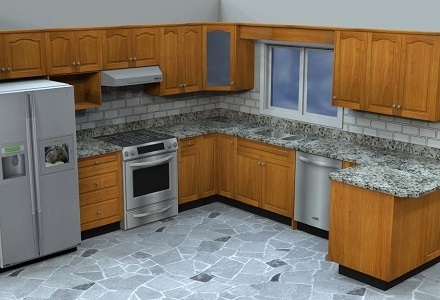 Sketchup provides near instant cabinet rendering. Cabinet drawings are accurate to 1000 of a millimeter and include some joinery. Renderings include wood, and counter textures. Cabinet parts are all organized in layers. Drawings are just one click away. Changes to job materials, rules or door style are quick and simple. All lists automatically recalculate with changes. You can clone jobs, rules or materials. Changes are quick and easy, even while sitting beside customers.